Dingo (plural: dingoes or dingos) is the common name for a type of Australian canid, Canis lupus dingo, characterized by a wolf-like head with erect, pointed ears, long legs, bushy tail, and soft and short fur that typically ranges in color from yellowish to yellowish red to reddish brown, with white often on the underside, tip of tail, and paws. Although commonly described as an "Australian wild dog," the dingo is not restricted to Australia, with modern dingoes also found throughout Southeast Asia, mostly in small pockets of remaining natural forest in Indonesia, Papau New Guinea, Malaysia, Philippines, Burma, Thailand, and southern China. The mainland Australian populations, which today are particularly in the north, are believed to have been introduced from Southeast Asia by aboriginal settlers thousands of years ago. The dingo is largely indistinguishable on morphological characteristics from the closely related domestic dog. In Australia, as a result of interbreeding with dogs introduced by European settlers, the purebred dingo gene pool is in decline. By the early-1990s, about a third of all wild dingoes in the south-east of the continent were dingo/domestic dog crosses, and although the process of interbreeding is less advanced in more remote areas, there is danger of the extinction of the subspecies in the wild. Although protection within Federal National Parks, World Heritage areas, Aboriginal reserves, and the Australian Capital Territory is available for dingoes, they are at the same time classified as a pest in other areas. Since a lack of country-wide protection means they may be trapped or poisoned in many areas, in conjunction with the hybridization with domestic dogs, the taxon was upgraded from "Lower Risk/Least Concern" to "Vulnerable" by the IUCN (International Union for the Conservation of Nature and Natural Resources) in 2004. While sometimes considered as a pest, or even a danger to people, ecologically, dingoes also can help to control prey populations. They consume a wide diversity of food, including insects, mice, rats, rabbits, possums, and kangaroos. (They also will consume various plant matter.) Some have maintained that their reintroduction of the dingoes to some areas of Australia could help in controlling introduced feral cats and red foxes. However, the introduction of the dingo itself has been blamed for the extinction of the thylacine (Tasmanian tiger or Tasmanian wolf). The dingo has somewhat long legs, a bushy tail, short fur, and erect, pointed ears. Compared to similarly sized domestic dogs, dingoes tend to have longer muzzles, larger carnassials, longer canine teeth, and a flatter skull with larger nuchal lines (Corbett 2005). Their dental formula is 3/3-1/1-4/4-2/3=42 (Corbett 2005). Dingoes lack the same degree of tooth crowding and jaw-shortening that distinguishes other dog breeds from wolves (DBI 2008). Adult dingoes are typically 48 to 58 centimeters (19–23 inches) tall at the shoulders and weigh on average 23 to 32 kilograms (50–70 pounds), though specimens weighing 55 kilograms (120 pounds) have been recorded (DBI 2008). The length from nose to tip of the tail averages around 123 centimeters (48 inches) (Rudolph 2003). Males are larger and heavier than females (Corbett 2005). Dingoes in southern Australia tend to be smaller than dingoes occurring in northern and north-western Australia. Australian dingoes are invariably larger than specimens occurring in Asia. Fur color is typically yellow-ginger, though tan, black, white, or sandy including occasional brindle can occur. Albino dingoes have been reported (DBI 2008). Any other colors are indicators of hybridization (Corbett 2005). Purebred dingoes have white hair on their feet and tail tip and lack dewclaws on their hindlegs (DBI 2008). Dingoes have features in common with both wolves and modern dogs and are regarded as more or less unchanged descendants of an early ancestor of modern dogs. The dingo cannot be easily or reliably distinguished based on external appearance (Rudolph 2003). The chromosome number of the dingo is 2n=78 (Corbett 2005), as with the domestic dog. Among notable behavior differences from the domestic dog is that the dingo breeds only once a year and it seldom barks, but rather howls. 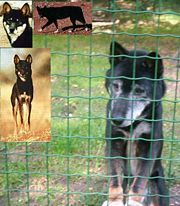 The dingo once was thought to be descended from the Iranian wolf (Canis lupus pallipes) (Jones et al. 1992). DNA analysis has indicated it to be more closely related to domestic dogs, suggesting that they were introduced from a population of domesticated dogs, possibly at a single occasion during the Austronesian expansion into Island Southeast Asia (Savolainen et al. 2004). The name dingo comes from the language of the Eora Aboriginal people, who were the original inhabitants of the Sydney area. The New Guinea singing dog is also classified as Canis lupus dingo. The dingo also is known by the common name of Warrigal. Dingoes are mostly seen alone, though the majority belong to packs that rendezvous once every few days to socialize or mate (Corbett 2005). Scent marking, howling, and stand offs against rival packs increase in frequency during these times. Packs of dingoes can number 3 to 12 individuals in areas with little human disturbance, with distinct male and female dominance hierarchies determined through aggression. Successful breeding is typically restricted to the dominant pair, though subordinate pack members will assist in rearing the puppies (Corbett 2005). The size of a dingo's territory has little to do with pack size, and more to do with terrain and prey resources. Dingoes in south-western Australia have the largest home ranges . Dingoes will sometimes disperse from the natal home ranges, with one specimen having been recorded to travel 250 kilometers (155 miles). Males scent mark more frequently than females, peaking during the breeding season (Corbett 2005). Dingoes do not bark as much as domestic dogs, which can be very loud, and dingoes howl more frequently. Three basic howls with over 10 variations have been recorded. Howling is done to attract distant pack members and it repels intruders. In chorus howling, the pitch of the howling increases with the number of participating members (Corbett 2005). Over 170 different animal species have been recorded in Australia as part of the dingo's diet, ranging from insects to water buffalo. Prey specialization varies according to region. In Australia's northern wetlands, the most common prey are magpie geese, dusky rats, and agile wallabies, while in arid central Australia, the most frequent prey items are European rabbits, long-haired rats, house mice, lizards, and red kangaroos. In north-western habitats, Eastern wallaroos and red kangaroos are usually taken, while wallabies, possums, and wombats are taken in the east and south eastern highlands. In Asia, dingoes live in closer proximity to humans, and will readily feed on rice, fruit, and human refuse. Dingoes have been observed hunting insects, rats, and lizards in rural areas of Thailand and Sulawesi. Dingoes in Australia will sometimes prey on livestock in times of seasonal scarcity (Corbett 2005). Dingoes will usually hunt alone when targeting small prey such as rabbits and will hunt in groups for large prey like kangaroos (Corbett 2005). Like wolves, but unlike domestic dogs, dingoes reproduce once annually. Male dingoes are fertile throughout the year, whereas females are only receptive during their annual estrus cycle. Females become sexually mature at the age of two years, while males reach sexual maturity at 1 to 3 years of age. Dominant females within packs will typically enter estrus earlier than subordinates. Captive dingoes typically have a pro-estrus and estrus period lasting 10–12 days, while for wild specimens it can be as long as 2 months (Corbett 2005). The gestation period of the dingo lasts 61 to 69 days, with litters usually being composed of 5 puppies. There is usually a higher ratio of females born than males. Puppies are usually born from May to July, though dingoes living in tropical habitats can reproduce at any time of the year. Puppies are usually born in caves, dry creekbeds or appropriated rabbit or wombat burrows. Puppies become independent at 3 to 6 months, though puppies living in packs will sometimes remain with their group until the age of 12 months. Unlike in wolf packs, in which the dominant animals prevent subordinates from breeding, alpha dingoes suppress subordinate reproduction through infanticide (Corbett 2005). Crossbreeding with pet and feral domestic dogs is currently thought to be the dingo's greatest threat for survival. Up to 80 percent of the wild dogs along Australia’s eastern seaboard are thought to be dog-dingo crossbreeds. The current Australian policy is to cull hybrids while protecting purebreds. This has proved effective on Fraser Island in Queensland, where dingoes are confined and introgression of domestic dog genes can be controlled. It has however proven to be problematic on mainland Australia, to the point where it is estimated that at the current rate of genetic introgression, pure dingoes should go extinct within 50 years. Conservationists are generally split into two groups; those who view crossbreeding as detrimental to the dingo's uniqueness, and those who believe genetics and appearance are irrelevant, as long as the animals maintain their ecological niche (Corbett 2004). All in all, little is known about the long-term effects of crossbreeding and crossbreeds cannot always be distinguished from pure dingoes. Some people claim that the Australian kelpie has some dingo blood; as it was illegal to keep dingoes as pets, some dingo owners registered their animals as kelpies or kelpie crosses. It should be noted that kelpies and dingoes are very similar in conformation and coloring. There is no doubt that some have deliberately mated dingoes to their kelpies. Hybrids may enter estrus twice annually, and have a gestation period of 58–65 days, but it is not sure whether they successfully raise two litters (Corbett 2005). In Australia, dingoes compete for the same food supply as introduced feral cats and red foxes, and also prey upon them (as well as on feral pigs). A study at James Cook University has concluded that the reintroduction of dingoes would help control the populations of these pests, lessening the pressure on native biodiversity (Millen 2006). The author of the study, Professor Chris Johnson, notes his first-hand observations of native rufous bettongs being able to thrive when dingoes are present. The rate of decline of ground-living mammals decreases from 50 percent or more, to just 10 percent or less, where dingoes are present to control fox and cat populations. The arrival of dingoes is thought by some to have been a major factor in the extinction of the thylacine (Thylacinus cynocephalus) in mainland Australia. Commonly known as the Tasmanian tiger or Tasmanian wolf, this was the largest carnivorous marsupial in modern times. Fossil evidence and Aboriginal paintings show that thylacines once inhabited the entire Australian mainland, only to suddenly disappear about 3000 years ago. Since dingoes are thought to have arrived around 500 years prior, certain scientists think this was sufficient time for the canids to impact on mainland thylacine populations, either through interspecific competition or through the diffusion of disease. Considering that thylacines managed to survive in the dingo-devoid island of Tasmania until the 1930s, some put this forward as further indirect evidence for dingo responsibility for the thylacine's disappearance (Ingleby 2003). Some authorities, however, doubt the impact of the dingo on the extinction of the thylacine, as the two species would not have been in direct competition with one another. The dingo is a primarily diurnal predator, while it is thought the thylacine hunted mostly at night. In addition, the thylacine had a more powerful build, which would have given it an advantage in one-to-one encounters (Campbell). However, recent morphological examinations on dingo and thylacine skulls show that although the dingo had a weaker bite, its skull could resist greater stresses, allowing it to pull down larger prey than the thylacine. The thylacine was also much less versatile in diet, unlike the omnivorous dingo (Macey 2007). Dingoes apparently were transported from mainland Asia, through South-East Asia to Australia and other parts of the Pacific region by Asian seafarers throughout their voyages over the last 5000 years. It is believed that dingoes arrived in Australia around 3500 to 4000 years ago, quickly spreading to all parts of the Australian mainland and offshore islands, save for Tasmania (Ingleby 2003). The dogs were originally kept by some Australian native groups for hunting, warmth, or as an emergency food source. European settlers did not discover dingoes until the seventeenth century, and originally dismissed them as feral dogs (Corbett 2005). Captain William Dampier, who wrote of the wild dog in 1699, was the first European to officially note the dingo (DBI 2008). Dingo populations flourished with the European's introduction of domestic sheep and European rabbit to the Australian mainland (DBI 2008). 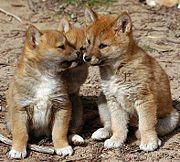 Currently, dingo puppies are only available within Australia and it is illegal to export them, though this may change through the urgings of breed fanciers. Although dingoes are generally healthier than most domestic dogs, and lack the characteristic "doggy odor" (DBI 2008), they can become problematic during their annual breeding season, particularly males which will sometimes attempt to escape captivity in order to find a mate (Coppinger and Coppinger 2001). As puppies, dingoes display typical submissive dog-like behavior, though they become headstrong as adults. However, unlike captive wolves, they do not seem prone to challenging their captors for pack status (Lorenz and Wilson 1977). There are mixed accounts on how captive dingoes are treated by native Aboriginal tribes. In 1828, Edmund Lockyer noted that the aboriginals he encountered treated dingo pups with greater affection than their own children, with some women even breastfeeding them. The dogs were allowed to have the best meat and fruit, and could sleep in their master's huts. When misbehaving, the dingoes were merely chastised rather than beaten. This treatment, however, seems to be an exception rather than a general rule. In his observations of Aboriginals living in the Gibson Desert, Richard Gould wrote that although dingoes were treated with great fondness, they were nonetheless kept in poor health, were rarely fed, and were left to fend for themselves. Gould wrote that tame dingoes could be distinguished from free ranging specimens by their more emaciated appearance. He concluded that the main function of dingoes in Aboriginal culture, rather than hunting, was to provide warmth as sleeping companions during the cold nights (Lindsay 2000). Some Australian Aborigines will routinely capture dingo pups from their dens in the winter months and keep them. Physically handicapped puppies are usually killed and eaten, while healthy ones are raised as hunting companions, assuming they do not run away at the onset of puberty (Lindsay 2000). However, Aboriginal women will prevent a dingo they have become attached to as a companion from escaping by breaking its front legs (Coppinger and Coppinger 2001). A dingo selected for hunting that misbehaves is either driven off or killed (Lindsay 2000). Dingoes may be used for hunting purposes by Aboriginals inhabiting heavily forested regions. Tribes living in Northern Australia track free ranging dingoes in order to find prey. 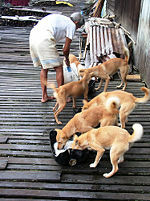 Once the dingoes immobilize an animal, the tribesmen appropriate the carcass and leave the scraps to the dingoes. In desert environments, however, camp dingoes are treated as competitors, and are driven off before the start of a hunting expedition. As Aboriginal hunters rely on stealth and concealment, dingoes are detrimental to hunting success in desert terrains (Lindsay 2000). Although humans are not natural prey for wild dingoes, there have been a number of instances in which people have been attacked by them. The most famous fatality case—which was the feature of a feature film, TV movie, TV miniseries, and an opera—is that of 10-week-old Azaria Chamberlain, who is thought to have been taken by a dingo on August 17, 1980 on Ayers Rock. The body itself was never found, and the child's mother was initially found guilty of murder and sentenced to life in prison. However, she later was exonerated of all charges and released when there was the chance discovery of a piece of Azaria's clothing in an area full of dingo lairs (Linnell 2002). However, since the Chamberlain case, proven cases of attacks on humans by dingoes have brought about a dramatic change in public opinion. It is now widely accepted that, as the first inquest concluded, Azaria probably was killed by a dingo, and that her body could easily have been removed and eaten by a dingo, leaving little or no trace. All other recorded attacks occurred on Fraser Island, where dingoes have become habituated to humans feeding them. This has lead to an increase in aggressive encounters between dingoes and humans. Between 1996 and 2001, 224 incidences of dingoes biting people were recorded (Linnell 2002), and on the 5th of May, 2001, two children were attacked near the remote Waddy Point campsite. The older of the two, a 9-year-old schoolboy was killed, while his younger brother was badly mauled. Three days later, two backpackers were attacked in the same area, leading to the government authorizing a cull, and the establishment of a A$1,500 fine to anyone found feeding dingoes (Hill 2001). Campbell, C. n.d. Introducing the thylacine. Thylacine Museum. Retrieved November 12, 2008. Coppinger, R., and L. Coppinger. 2001. Dogs: a Startling New Understanding of Canine Origin, Behavior and Evolution. New York: Scribner. ISBN 0684855305. Corbett, L. K. 2008. Canis lupus ssp. dingo. 2008 IUCN Red List of Threatened Species. Downloaded November 12, 2008. Corbett, L. K. 2005. 9.1 Dingo. Canis lupus dingo. Canid Species Accounts. IUCN/SSC Canid Specialist Group. Retrieved November 12, 2008. Corbett, L. 2004. The great dingo dilution. ECOS 118: 10-12. Retrieved November 12, 2008. Dog Breed Info (DBI). 2008. Dingo (Australian Native Dog). Dogbreedinfo.com. Retrieved November 12, 2008. Hill, A. 2001. Dingoes attack British backpackers days after boy mauled to death. Guardian May 6, 2001. Retrieved November 12, 2008. Ingleby, S. 2003. Dingoes in Australia: Their origins and impact. Australian Museum. Retrieved November 12, 2008. Jones, S., R. D. Martin, and D. R. Pilbeam. 1992. The Cambridge Encyclopedia of Human Evolution. Cambridge, England: Cambridge University Press. ISBN 0521323703. Lindsay, S. R. 2000. Handbook of Applied Dog Behavior and Training, Vol. 1: Adaptation and Learning. Ames Iowa State Univ. Press. ISBN 0813807549. Linnell, J. D. C., R. Andersen,Z. Andersone, et al. 2002. The fear of wolves: A review of wolf attacks on humans. Norsk Institutt for Naturforskning. Retrieved November 12, 2008. Lorenz, K., and M. Kerr Wilson. 1977. Man Meets Dog. London: Methuen. ISBN 0416573207. Macey, R. 2007. Tiger's demise: Dingo did do it. Sunday Morning Herald September 6, 2007. Retrieved November 12, 2008. Millen, T. 2006. Call for more dingoes to restore native species. ECOS 133: 5. Retrieved November 12, 2008. Rudolph, E. K. 2003. Dingo: Canis familiaris. DrEllenRudolph.com. Retrieved November 12, 2008. Savolainen, P., T. Leitner, A. N. Wilton, E. Matisoo-Smith, and J. Lundeberg. 2004. A detailed picture of the origin of the Australian dingo, obtained from the study of mitochondrial DNA. PNAS 101(33): 12387-12390. Retrieved November 12, 2008. BBC story on dingo mitochondrial DNA study.